Front door mat. Heavy recycled rubber. Grit non-slip surface for exceptional scraping. Innovative, micro bead, ChromaGrit scraping surface that cleans shoes while hiding dirt in recessed channels. The anti-slip surface provides aggressive scraping action and repels water for great traction in all weather conditions. The unique multi-color surface reflects light for a sparkling effect, while never fading from sunlight. 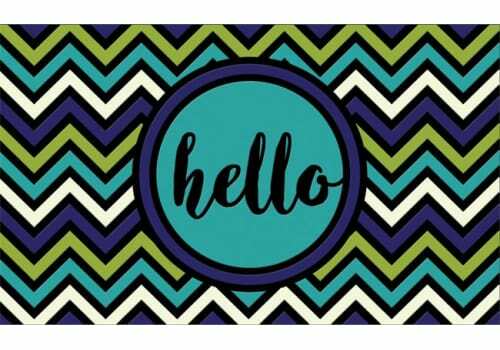 These decorative doormats are easy to maintain: dirt, pet hair and lint won't damage the surface and can be simply hosed off or vacuumed. Long lasting and durable. The thick, molded, 100% recycled rubber base is heavy and therefore minimizes movement of the mat. Note: The CleanScrape mats are intended for outdoor use only. Some of these entry mats have holes that go all the way through the mat. If water drainage is a significant issue, this style mat may provide improved performance. 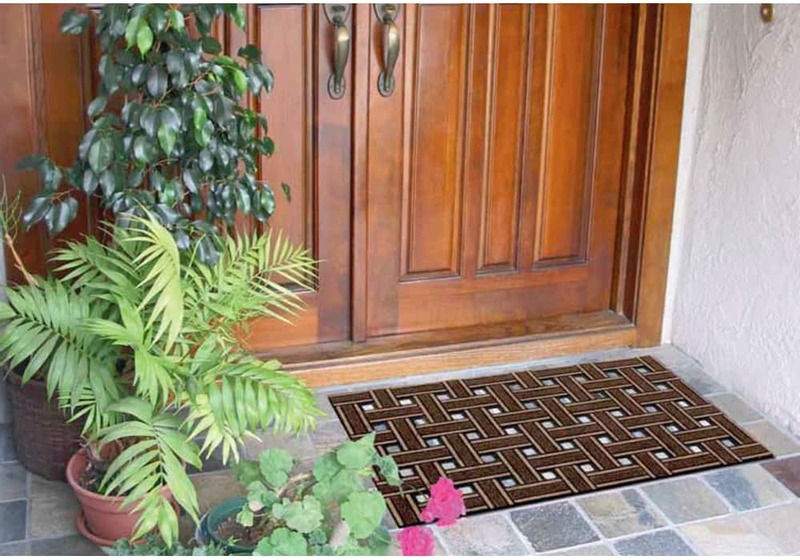 These durable front door mats made in the USA make the ideal welcome mat. Made with an innovative, micro bead, ChromaGrit scraping surface that cleans shoes while hiding dirt in recessed channels. The anti-slip surface provides aggressive scraping action and repels water for great traction in all weather conditions. The unique multi-color surface reflects light for a sparkling effect, while never fading from sunlight. These outdoor doormats with saysings are easy to maintain: dirt, pet hair and lint won't damage the surface and can be simply hosed off or vacuumed. Long lasting and durable. The thick, molded, 100% recycled rubber base is heavy and therefore minimizes movement of the scraper door mat. 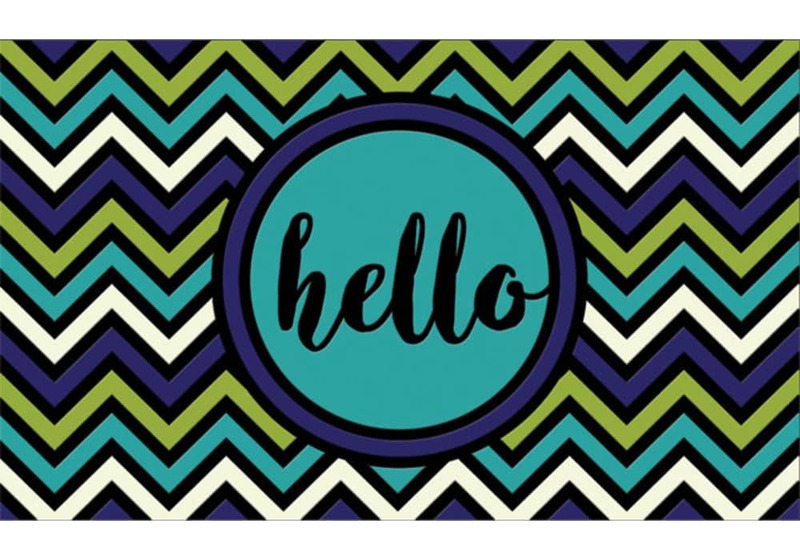 Help the environment and get a nice mat in the process! Each high quality, recycled rubber door mat is made from used tire scraps and are 88% green by weight. When you purchase this item, you are helping to keep America clean by keeping these tires out of landfills! Note: The CleanScrape mats are intended to be used as outside door mats only. Some of these welcome door mats have holes that go all the way through the mat. If water drainage is a significant issue, this style mat may provide improved performance.